What is a Pro Rata (Pro-Rata) and Why Does it Matter? A very common term in Retail Real Estate is Pro Rata (sometimes spelled Pro-rata or Prorata) which usually refers to how reimbursable expenses will be divided up among tenants and the landlord. As with many legal terms of art, Pro Rata is derived from the Latin words: Pro (meaning “according to”) and Ratus (meaning “calculated”). In Retail Real Estate, mostly in Shopping Center leases, the term pro rata is used to describe how reimbursable expenses (also call Triple Net expenses or NNN) are divided in an equitable manner between all the tenants and sometimes the landlord. The Triple Net lease is one where the “rent” the landlord receives is net of expenses for operating the shopping center.. 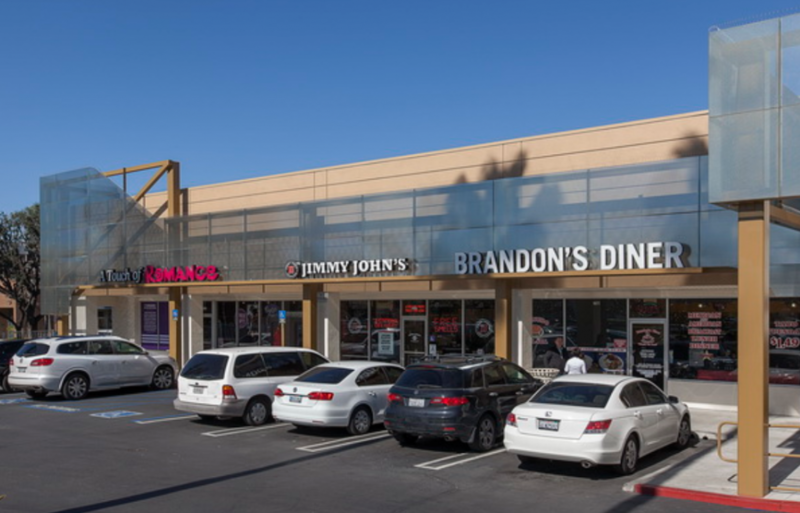 Typically, shopping center leases provide for the tenants to pay for all of the cost of maintaining an operating the common areas, liability insurance for the common areas, property insurance for the building and the real estate taxes assessed to the property. A shopping center lease goes into lengthy detail about how the tenant share of reimbursable expenses are calculated. Typically, the tenant pays its pro rata share of the total reimbursable expenses based on the size of that tenants leased space. For example, if a tenant leases 1,000 square feet in a 5,000 square foot shopping center the tenant’s share would be twenty percent (20%). Or if an anchor tenant leases 65,000 square feet in a 100,000 square foot shopping center their share would be sixty five percent (65%). The shopping center landlord will keep track of the entire amount of reimbursable expenses and then allocate the tenant share of the expenses to each tenant. In the example above, for the 1000 square-foot tenant if the total real estate taxes we’re $10,000 that tenants pro-rata share would be $2000. In the lease between the landlord and the tenant it will have a calculation which gives the tenant share as a fraction of the total. The numerator (top number of the fraction) is the size of the tenant’s space. The denominator (the bottom number of the fraction) is the total size (Gross Leasable Area or GLA) of the shopping center. The numerator is fixed at the size of the tenant’s space. The denominator is sometimes a little harder to define depending on the type of shopping center and the type of expense. In larger Enclosed Malls the department store anchor tenants may not be included in the calculation of Common Area expenses. So even though the total mall Gross Leasable Area might be 800,000 the main two anchor tenants occupying 200,000 square feet each might be excluded from the calculation which would leave the remainder of the tenants dividing the costs on 400,000 square feet. This very rarely happens with strip centers. However, you may have different denominators on Common Area Maintenance and Real Estate Taxes based on separately accessed parcels. For example, an out parcel tenant (buildings in front of main shopping center i.e. Starbucks, McDonald’s or CVS) might pay their own real estate tax directly to the county but pay their share of real estate taxes. There is another part of calculating a tenant’s Pro Rata which will affect the tenant occupancy costs. Shopping center landlords can calculate pro rata on either a “Leased” or “Leasable “ Pro Rata. The difference in cost to the tenant could be significant. The examples used above are all based on leasable square footage. 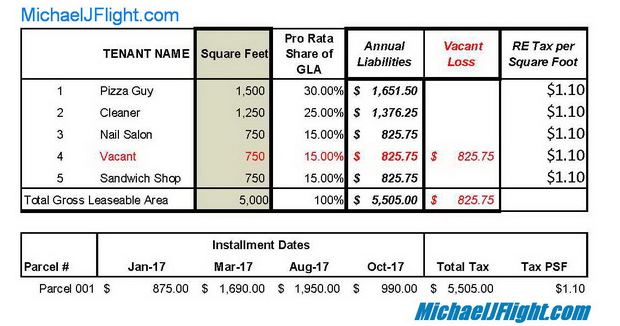 However with Leased square footage method of calculating the pro Rata the denominator will change with the vacancy rate of the shopping center. To use our 5,000 square foot shopping center example above: If a tenant is leasing 1,000 square feet and 4000 square feet is leased with a 1000 square foot vacancy the numerator would be 1,000 and the denominator would be 4,000. In this situation the tenant’s Pro Rata share of the reimbursable expenses would be = 25%. In conclusion, you will here the term Pro Rata a lot in the shopping center business. Now you will know it is used to describe how reimbursable Triple Net expenses ( NNN ) expenses are divided in an equitable manner between all the tenants and vacant spaces in a shopping center. The Triple Net lease is one where the “rent” the landlord receives is net of expenses for operating the shopping center.. Typically, shopping center leases provide for the tenants to pay for all of the cost of maintaining an operating the common areas, liability insurance for the common areas, property insurance for the building and the real estate taxes assessed to the property. 10.01 Common Area Defined. The term Common Area shall include, but not be limited to, any and all parking areas, roads, streets, access drives (exclusive of the Service Area), sidewalks, landscaped areas, ramps, walkways, entrances and exits, curb-cuts, lighting equipment, surface drainage facilities, traffic control signs, fences, retaining walls, Tenant Identification Pylon Signs and Cermak Plaza Pylon Signs, traffic control lights, and other common areas and improvements from time to time located on the Shopping Center Parcel and all easement areas appurtenant thereto. 10.02 Common Area Rights and Privileges. Tenant, its employees, agents, invitees, licensees, subtenants, concessionaires and contractors (together its “Permitees”) shall have the non-exclusive right to use the Common Area in common with Landlord, other tenants in the Shopping Center, and their respective Permitees. 10.03 Maintenance. Landlord shall, during the Term, operate and maintain the Common Area and maintain the Service Area. Landlord shall be responsible for the removal of snow and ice from the Common Area and shall maintain the Common Area in good condition and repair, clean and free from snow, ice, rubbish and debris, and adequately drained (including prevention of ponding and the prevention of drainage toward the Building). Such maintenance and repair shall include, but not be limited to, the following: regular and timely removal of all litter, garbage, trash and waste; regular lawn mowing; tree, shrub, and plant pruning and trimming, including all necessary maintenance to avoid the interference of the visibility of the signs referenced in Article 7 (Signs); maintaining and watering of landscaped areas; weed control; pest control; keeping the parking areas, walks and driveways and roads clean and in good repair (including removal of snow and ice); completing all necessary striping of all parking and driveway areas in accordance with Section 11.05 (Parking Spaces); illuminating the Common Area in accordance with Section 11.06 (Lighting), and providing all necessary security. The standard for such maintenance shall be maintenance in a manner and quality equal to at least that maintained by the owners of first-class facilities of the same type in the _________ metropolitan area. All such maintenance and operation of the Common Area by Landlord shall comply with all present and future laws, ordinances, orders, rules, regulations, notices of violations, and requirements of public authorities applicable thereto even though by law other tenants in the Shopping Center may have such duty or responsibility solely or jointly with Landlord. Where such laws, ordinances, orders, rules, regulations, notices of violation and requirements of public authorities conflict with the requirements set forth herein, such laws, ordinances, orders, rules, regulations, notices of violation and requirements of public authorities shall supersede the provisions of this Lease; provided, however to the extent the provisions of this Lease can be amended to comply with such, ordinances, orders, rules, regulations and to preserve the intent of the Parties, the Parties agree to enter into such an amendment. (a) Maintenance of landscaping in the Common Area including replanting and replacing dead trees, flowers and other landscaping. (b) Sweeping, graffiti removal and cleaning of the Common Area. (c) Removal of snow and ice from the Common Area and expenses for snow removal supplies utilized exclusively in the Common Area. (f) Charges for actual separately metered consumption of utilities attributable to the operation, maintenance, and lighting of the Common Area. (g) Repair, minor repaving, sealing, and re-striping of the Common Area. Such repairs shall include maintenance, minor repair and elimination of dangerous conditions associated with sidewalks, curbs, ramps, planters and other concrete structures located in, on or about the Common Areas and not exclusively serving a single tenant within the Shopping Center, including, but not limited to, repairs required for compliance with the Americans with Disabilities Act, as amended. (h) Security for the Common Areas. (i) Premiums for general liability insurance required pursuant to the terms and provisions of Section 15.02 (Landlord’s Liability Insurance). (j) Maintenance, repair, and replacement (light bulbs only) of lights and fixtures in the Common Area, provided that Tenant shall have no obligation to pay any portion of lease payments for lights and fixtures which are leased by Landlord from a third party. (k) An administrative fee or management fee not exceeding fifteen percent (15%) of the Common Area Maintenance Costs excluding utility and insurance costs. (l) Pest control as required to maintain those portions of the Common Area not exclusively serving a single tenant. (m) Sewer, plumbing and water service repairs located in, on, about or under the Common Areas and not exclusively serving a single tenant within the Shopping Center, as well as water and sewer usage charges in connection with same. (n) Maintenance, repair and electric current expenses paid by Landlord related to the traffic control lights. (o) Maintenance, repair and electric current expenses related to the Pylon Signs. (p) Salaries and salary expenses including but not limited to: payroll taxes, health benefits, unemployment insurance and workers’ compensation insurance for employees strictly serving the Shopping Center provided, however, that no such employees shall be members of Landlord or any entity affiliated with Landlord. (q) Maintenance, repair, rental and leasing of equipment required to maintain the Common Area strictly and exclusively serving the Shopping Center. 10.05 Tenant’s Share of Common Area Maintenance Costs. (a) Definition. Commencing on the Rent Commencement Date, Tenant agrees to pay Tenant’s pro rata share of the Common Area Maintenance Costs (“Tenant’s CAM Share”) in equal monthly installments (“Tenant’s CAM Installments”), which shall be due and payable at the time Base Rent payments are due and payable hereunder. Tenant’s CAM Share for the first Lease Year shall be referred to as “Tenant’s Initial CAM Share”. Tenant’s CAM Share shall be an amount calculated by multiplying the amount of the Common Area Maintenance Costs being prorated by a fraction, the numerator of which is the Floor Area of the Leased Premises and the denominator of which is the total number of square feet of Floor Area within the Shopping Center, including the Leased Premises (but not less than 5,000 square feet). “Floor Area” is defined as, the total number of square feet of floor area located within the perimeter walls of the building(s) in the Shopping Center, as the same are constructed from time-to-time, which number of square feet shall be based upon measurements extending from the midpoint of the demising walls of such building(s) and the exterior surface of the perimeter walls of such building(s). (b) Monthly CAM Installments. Prior to the first day of the first Lease Year, Landlord shall provide Tenant with a statement, supported by invoices and such other documentation reasonably satisfactory to Tenant, setting forth a good faith estimate of Tenant’s Initial CAM Share. Subject to the limitations stated in Section 11.11(e) (Caps on Tenant’s CAM Share), Tenant’s estimated share for each successive Lease Year shall be equal to the amount shown on the CAM Statement for the prior Lease Year. (c) Annual CAM Statement and Reconciliation. Annually, within ninety (90) days after the end of each Lease Year, Landlord shall deliver to Tenant a statement (“CAM Statement”) showing all Common Area Maintenance Costs for the Lease Year just ended (accompanied by supporting documentation, such as receipts and invoices, evidencing such expenditures), the amount of Tenant’s CAM Share, and the monthly CAM Installments paid by Tenant during such Lease Year. If Tenant’s CAM Share for any Lease Year during the Term exceeds the total of Tenant’s CAM Installments for such year, Tenant shall pay to Landlord the amount of the deficiency within sixty (60) days after receipt of Landlord’s CAM Statement for such year, subject to the provisions of Section 11.11(d) (Tenant’s Right to Dispute CAM Statements) and subject to the provisions of Section 11.11(e) (Caps on Tenant’s CAM Share). If Tenant’s CAM Installments for a calendar year exceed Tenant’s Share of Common Areas Costs for such year, Tenant shall be entitled to choose to either offset the excess amount against CAM Installments next coming due under this Lease, or receive an immediate refund from Landlord. Investing in Concordia Realty Corporation’s investments involves a high degree of risk, including the possible complete loss of your investment. In addition to being an illiquid investment with an uncertain liquidity date, these investments may have other risks. The past performance of any of Concordia Realty Corporation or its affiliates investments is no guarantee of future results. View Risk Factors.